First time using a pressure cooker. These turned out good but took longer than 20 minutes, more like an hour. Will be interesting to see how long they take to cook next time. Goes with Snap Pea Salad with Buttermilk Dressing and Chile-Glazed Baby Back Ribs. Rinse and sort through the beans to remove any debris. Soak the beans overnight with 8 cups water mixed with 1 tablespoon salt. After soaking, drain and rinse beans; discard soaking liquid. Set electric pressure cooker to sauté setting, or place stovetop cooker over over medium-high heat, and add bacon. Cook until crisp, about 5 minutes. Using a slotted spoon, remove bacon and transfer to a plate lined with paper towels. Add onion to the pressure cooker with bacon drippings; cook until tender, about 3 minutes. Add remaining 2 cups water, molasses, tomato purée, brown sugar, dry mustard, 2 teaspoons salt and pepper to the pressure cooker and stir to combine. Stir in the soaked beans. Select high pressure and cook for 20 minutes. (Cooking times may vary according to cooker; check manufacturers' recommendations for precise cook times.) 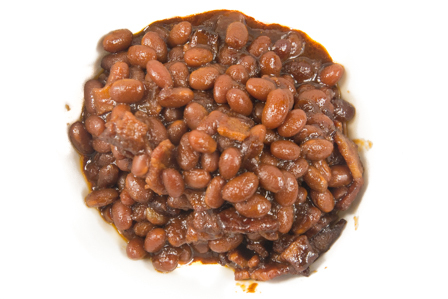 Once steam is released, check to ensure beans are tender; if not, continue to pressure cook in 5 minute intervals. Select reduce or sauté setting on electric pressure cooker or over medium-high heat; uncovered, simmer beans until sauce is reduced and thickened, about 10 minutes. Taste and adjust seasoning with salt and pepper.